HB-ZSX new registered - Robinson R44 Raven II s/n 12829 built in 2009 and former D-HFCW is new registered as HB-ZSX operated and owned by Helialpin AG. HB-ZSA ownership change - Robinson R44 Clipper II HB-ZSA is new operated and owned by Valair AG. HB-ZVI new registered - AS.350B3e (H125) s/n 8673 built in 2019 is new registered as HB-ZVI operated and owned by Europavia (Suisse) SA. HB-ZST new registered - Robinson R44 Astro s/n 0147 built in 1995 and former D-HWIT is new registered as HB-ZST operated and owned by Simplon Air GmbH. The helicopter will be used by Simplon Air Flightschool at Lugano. HB-ZMK ownership change - AS.350B3e (H125) HB-ZMK is new operated by Heli Reza SA and owned by UBS Switzerland AG, Investitionsgüterleasing. Helitrade SA handed over today HB-ZMK to Heli Rezia SA after a retrofit work done by SHM Gordola. HB-ZUG new registered - AS.350B3e (H125) s/n 8561 built in 2019 and former OE-XUK is new registered as HB-ZUG operated by Linth Air Service AG and owned by IG Leasing AG. The helicopter will be used by Alpine Helicopters based in Sion. HB-ZSW cancelled - EC-135P2+ HB-ZSW of Helialpin AG / Müller Handels AG has been cancelled in the swiss aircraft register. HB-ZXB cancelled - Marenco SKYe SH09 HB-ZXB of Kopter Group AG has been cancelled in the swiss aircraft register. HB-ZPW cancelled - Robinson R22 Beta II HB-ZPW of Airport Helicopter AHB AG has been cancelled in the swiss aircraft register. HB-ZDW cancelled - Robinson R44 Raven HB-ZDW of Airport Helicopter AHB AG has been cancelled in the swiss aircraft register following it's accident earlier this year. HB-ZUT owner change - AS.350B3 Ecureuil HB-ZUT is new owned by Scenic Air AG remaining operated by Air Glaciers SA. HB-ZWT owner change - AS.350B3e (H125) HB-ZWT is now owned and operated by Swiss Helicopter AG. Rega becomes launch customer for new H145 retrofit - During the Heli-Expo Atlanta, Swiss Air Ambulance Rega has taken the decision to retrofit its entire H145 fleet of seven helicopters to the new 5-bladed version, that was revealed by Airbus at Heli-Expo. HB-XQE operator change - A109E Power HB-XQE is new operated by Linth Air Service AG remaining owned by GCC Global Consulting et Communication Sàrl. HB-ZCP operator change - A109E Power HB-ZCP is new operated by Linth Air Service AG remaining owned by GCC Global Consulting et Communication Sàrl. HB-ZQM new registered - MBB-BK117 D-2 (H145) s/n 20247 built in 2019 and tested as D-HADY is new registered as HB-ZQM operated and owned by Schweizerische Luft-Ambulanz AG. HB-ZWT new registered - AS.350B3e (H125) s/n 8668 built in 2019 and tested as F-WWPO is new registered as HB-ZWT operated by Swiss Helicopter AG and owned by Europavia (Suisse) SA. HB-ZCQ owner change - A109E Power HB-ZCQ is new owned by Porter SA remaining operated by Karen SA. HB-ZLC cancelled - EC120B Colibri HB-ZLC of Helipool GmbH has been cancelled in the swiss aircraft register just 4 days after its registration. The helicopter has been sold to Germany prior arriving in Switzerland. HB-ZNX new registered - Belll 407GXP s/n 54723 built in 2017 and former N829XC is new registered as HB-ZNX operated and owned by Centaurium Aviation AG. HB-ZLC new registered - EC120B Colibri s/n 1640 built in 2010 and former LV-CGX is new registered as HB-ZLC operated and owned by Helipool GmbH. HB-ZWB ownership change - EC120B Colibri HB-ZWB is new operated and owned by Helipool GmbH. HB-ZPL new registered - AW109SP Grand New s/n 22360 built in 2016 and former I-AWCX is new registered as HB-ZPL operated by Swiss Helicopter AG and owned by Altruria Ltd LLC. HB-ZLQ cancelled - Robinson R22 Beta II HB-ZLQ of swiss-acm Ltd has been cancelled in the swiss aircraft register. The helicopter has been replaced with Robinson R44 Clipper II HB-ZTX. HB-ZLC coming soon - EC120B Colibri s/n 1640 built in 2010 and former LV-CGX has been purchased by Helipool GmbH and is reserved as HB-ZLC. HB-ZDW accident - Robinson R44 Raven HB-ZDW of Airport Helicopter AHB AG has been damaged yesterday in an emergency landing next Beromünster. The crew is not injured. HB-ZTX new registered - Robinson R44 Clipper II s/n 11892 built in 2007 and former F-GYAD is new registered as HB-ZTX operated and owned by swiss-acm Ltd.
HB-ZLV operator change - AS.350B3+ Ecureuil HB-ZLV is new operated by Héli-Alpes SA for a drylease from Heli-TV SA during the winter season. HB-ZDX cancelled - AS.350B3 Ecureuil HB-ZDX of Swiss Helicopter AG has been cancelled in the swiss aircraft register. HB-ZPL coming soon - AW109SP Grand New s/n 22360 built in 2016 has been delivered as I-AWCX to Locarno. This helicopter will be registered soon as HB-ZPL operated by Swiss Helicopter AG and owned by Altruria Ltd.
HB-ZOU in new colors - AS.350B3e (H125) HB-ZOU of Lions Air Skymedia AG / Snowland Europe SA is flying now in a new blue livery wearing as well Alpine Aviation titles. HB-ZMK ownership change - AS.350B3e (H125) HB-ZMK is new operated and owned by Helitrade AG. HB-ZQL new registered - MBB-BK117 D-2 (H145) s/n 20243 built in 2018 is new registered as HB-ZQL operated and owned by Schweizerische Luft-Ambulanz AG. HB-ZMW ownership change - Robinson R66 Turbine HB-ZMW is new operated by Valair AG and owned by Sundance Swiss Tourism & Brands AG. HB-ZAV cancelled - Bell 206L-4 Long Ranger IV HB-ZAV of Helvetica Jet Service SA has been cancelled in the swiss aircraft register only a few weeks after it's registration. The helicopter will be new registered in Germany as D-HEDC. HB-ZTA new registered - AS.350B3e (H125) s/n 8627 built in 2018 and tested as F-WJXM is new registered as HB-ZTA operated and owned by Europavia (Suisse) SA. HB-ZCM accident - AS.350B3 Ecureuil HB-ZCM of Heli Rezia AG has been damaged today in an accident at Arbedo-Castione. The crew is slightly injured. HB-ZBG cancelled - SA.365N1 Dauphin 2 HB-ZBG of Swift Copters SA / Algum Ltd has been cancelled in the swiss aircraft register after serving over 19 years in the fleet of Swift Copters SA. HB-ZQJ new registered - MBB-BK117 D-2 (H145) s/n 20232 built in 2018 and former D-HADK is new registered as HB-ZQJ operated and owned by Schweizerische Luft-Ambulanz AG. completed its first flight test schedule, which included a series of maneuvers aimed to obtaining preliminary flight data, validating test design features and evaluating flight qualities. P3 will continue the development of the SH09 by performing an intensive flight test campaign in Sicily whilte the Kopter team in Mollis will finalize the preparation of the next prototype, the Pre-Series number 4 (PS4). HB-ZWR new registered - Bell 505 Jet Ranger X s/n 65125 built in 2018 and former C-GFNR is new registered as HB-ZWR operated by Robert Fuchs AG, Fuchs Helikopter and owned by Loxia Swiss GmbH. HB-ZAV new registered - Bell 206L-4 Long Ranger IV s/n 52097 built in 1994 and former N246BH is new registered as HB-ZAV operated and owned by Helvetica Jet Service SA. HB-ZAU cancelled - Schweizer 269C-1 (300CBi) HB-ZAU of Raoul Wyssen has been cancelled in the swiss aircraft register. The helicopter will be new registered in Slovakia as OM-HCY. Kopter announces a firm order with SAS - On the occasion of Helitech 2018, Systematic Aviation Services (SAS) from Malaysia has signed a firm order with Kopter for one SH09 helicopter in passenger transport configuration. To promote this new customer, Kopter has wrapped its first prototype (P1) using the paint scheme of SAS, and is exhibiting it on the Kopter booth at Helitech. HB-ZSC operator change - Robinson R44 Raven II HB-ZSC is new operated and owned by Top Client Service AG. HB-ZMZ cancelled - A109E HB-ZMZ of Swiss Helicopter AG / SIMU Trade Consulting GmbH has been cancelled in the swiss aircraft register. The helicopter will be new registered in Malta as 9H-TTT. HB-ZUE new registered - EC135T2+ s/n 0672 built in 2008 and former OE-XRU is new registered as HB-ZUE operated by Lions Air Skymedia AG and owned by Schider Helicopter Service GmbH. HB-ZQI new registered - MBB-BK117 D-2 (H145) s/n 20225 built in 2018 and former D-HBTJ is new registered as HB-ZQI operated and owned by Schweizerische Luft-Ambulanz AG. HB-ZGU cancelled - MD600N HB-ZGU of Robert Fuchs AG has been cancelled in the swiss aircraft register. The helicopter will be new registered in the UK as G-GREM. HB-ZQC new registered - AS.355N Ecureuil 2 s/n 5562 built in 1994 and former ZS-HNB is new registered as HB-ZQC operated and owned by Helipool GmbH. HB-ZKB cancelled - AS.355F2 Ecureuil 2 HB-ZKB of Helipool GmbH has been cancelled in the swiss aircraft register. The helicopter has been flown to the UK and will be new registered as G-NBPL. HB-ZUR new registered - Robinson R66 Turbine s/n 0573 built in 2015 and former F-GASJ is new registered as HB-ZUR operated and owned by Robert Fuchs AG, Fuchs Helikopter. HB-ZLM ownership change - Agusta-Bell 206A Jet Ranger HB-ZLM is new operated and owned by Mariana Matt. HB-ZML ownership change - AS.350B3e (H125) HB-ZML is new operated by Robert Fuchs AG, Fuchs Helikopter and owned by UBS Switzerland AG. HB-ZGA new registered - AS.350B3e (H125) s/n 8371 built in 2017 and former OE-XAE of Heli Austria is new registered as HB-ZGA operated by Linth Air Service AG and owned by BACA Hydra Leasing GmbH. HB-ZTO ownership change - AS.350B3e (H125) HB-ZTO is new operated and owned by Swiss Helicopter AG and is now based at Gsteigwiler. HB-ZAW ownership change - Robinson R44 Raven II HB-ZAW is new operated by Association F4 and owned by Innovaz SA. HB-ZHF cancelled - Schweizer 269C HB-ZHF of Swiss Helicopter has been cancelled in the swiss aircraft register. The helicopter will be new registered in South Africa as ZT-ROW. HB-ZVC new registered - Robinson R66 Turbine s/n 0884 built in 2018 is new registered as HB-ZVC operated by Valair AG and owned by Swiss Red Wings AG. HB-XFQ cancelled - Schweizer 269C HB-XFQ of Swiss Helicopter has been cancelled in the swiss aircraft register after over 20 years in operation with Heliswiss and Swiss Helicopter. HB-ZWI new registered - EC135 P3H (H135) s/n 2062 built in 2018 and former D-HCBI is new registered as HB-ZWI operated by Calanda Wings AG and owned by Würth Leasing AG after the delivery from Europavia (Suisse) SA. The helicopter is equipped with Helionix avionics. HB-XVA cancelled - AS.350B2 Ecureuil HB-XVA of Schweizerische Eidgenossenschaft has been cancelled in the swiss aircraft register after over 27 years since it was registered in 1990. Exactly 50 helicopters are now remaining registered in the HB-X series. The helicopter will be new registered in Austria as OE-XSB. 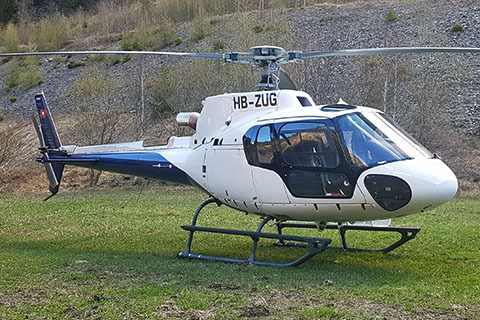 HB-ZOI cancelled - AS.350B3e (H125) HB-ZOI of Heli-TV SA has been cancelled in the swiss aircraft register following it's accident last year. HB-ZEF operator change - EC135 T3 HB-ZEF is new operated by Air Glaciers SA remaining owned by Air Zermatt AG. HB-ZAP owner change - Bell 429 HB-ZAP is new owned and operated by Héli-Alpes SA. HB-ZML new registered - AS.350B3e (H125) s/n 8558 built in 2018 is new registered as HB-ZML operated and owned by Europavia (Suisse) SA. HB-ZQH new registered - MBB-BK117 D-2 (H145) s/n 20212 built in 2018 and former D-HADA is new registered as HB-ZQH operated and owned by Schweizerische Luft-Ambulanz AG. HB-ZGQ in new colors - EC-120B Colibri HB-ZGQ of Mountain Flyers 80 Ltd is flying now in a new livery with the same colors as their EC130T2 (H130) HB-ZON. HB-ZYT new registered - Robinson R66 Turbine s/n 0871 built in 2018 is new registered as HB-ZYT operated and owned by Scilla Consulting GmbH. HB-ZIN cancelled - EC-130B4 HB-ZIN of Héli-Alpes SA has been cancelled in the swiss aircraft register. The helicopter will be new registered in Italy as I-NWSE. HB-ZCW ownership change - MD900 HB-ZCW is new operated by Simplon Air GmbH and owned by UBS Switzerland AG. HB-ZQG new registered - MBB-BK117 D-2 (H145) s/n 20195 built in 2018 and former D-HCBP is new registered as HB-ZQG operated and owned by Schweizerische Luft-Ambulanz AG. HB-ZOY ownership change - AS.350B3e (H125) HB-ZOY is new operated and owned by Air Zermatt AG. HB-ZGN ownership change - EC120B Colibri HB-ZGN is new operated and owned by Laurent Marcel André Seydoux. HB-ZYN new registered - Bell 505 Jet Ranger X s/n 65061 built in 2018 and former C-FZEX is new registered as HB-ZYN operated by Héli-Alpes SA and owned by SG Equipment Finance Schweiz AG. After the final assembling by RUAG, the helicopter will soon join the fleet for school and charter operations. HB-ZON ownership change - EC130T2 (H130) HB-ZON is new operated by Mountain Flyers 80 Ltd and owned by Centaurium Aviation AG. Tragic crash - AS.350B3 Ecureuil HB-ZOJ of BEO Helicopter / Lions Air Skymedia AG crashed today in the region of Attinghausen UR during a transport flight. The pilot did not survive this accident. My deepest sympathy goes to the families and friends of the dead pilot. HB-ZLH cancelled - AS.350B3+ Ecureuil HB-ZLH of LeadEx Ltd has been cancelled in the swiss aircraft register. The helicopter will be new registered in Poland as SP-SRB. HB-ZKF cancelled - AS.350B3+ Ecureuil HB-ZKF of Air Zermatt AG has been cancelled in the swiss aircraft register following it's accident last month at Raron. HB-ZMK new registered - AS.350B3e (H125) s/n 8550 built in 2018 is new registered as HB-ZMK operated and owned by Europavia (Suisse) SA. HB-ZOZ new registered - Bell 429 s/n 57330 built in 2018 and former C-FYLF is new registered as HB-ZOZ operated and owned by Air Zermatt AG. HB-ZKO in new colors - Agusta A119 Koala HB-ZKO of Heli-Lausanne SA / Orllati Logistique SA is flying now in a new anthracite livery. HB-ZLV operator change - AS.350B3+ Ecureuil HB-ZLV is again operated by Heli-TV SA after the drylease to Héli-Alpes SA during the winter season. HB-ZOU new registered - AS.350B3e (H125) s/n 8490 built in 2018 and former F-HKPL is new registered as HB-ZOU operated by Lions Air Skymedia AG and owned by Snowland Europe SA. HB-ZIR cancelled - EC-135T1 HB-ZIR of Air Glaciers SA / EMJ Heli Services AG has been cancelled in the swiss aircraft register following it's accident last month at Grand-Saint-Bernard. HB-ZOB new registered - Robinson R22 Beta II s/n 4615 built in 2013 and former OE-XPD is new registered as HB-ZOB operated and owned by Mountain Flyers 80 Ltd.
HB-ZGQ ownership change - EC-120B Colibri HB-ZGQ is new operated by Mountain Flyers 80 Ltd and owned by Centaurium Aviation AG. After the takeover of Heli-West AG by Mountain Flyers 80 Ltd, HB-ZGQ is now flying at Grenchen under the name Mountainflyers Heli-West AG. An R22 will join soon as well. HB-ZAR operator change - AS.350BA Ecureuil HB-ZAR is new operated and owned by Ancor AG. HB-XRL cancelled - SA.315B Lama HB-XRL of Air Glaciers SA has been cancelled in the swiss aircraft register. This helicopter was over 31 years registered with Air Glaciers and flew over 20'000 flying hours. HB-ZPN ownership change - AS.350B3e (H125) HB-ZPN is new operated and owned by Heli-TV SA. HB-ZTZ new registered - Robinson R66 Turbine s/n 0189 built in 2012 and former N42LK is new registered as HB-ZTZ operated by Valair AG and owned by Helios Aviation AG. The helicopter will later flying for Volcano Heli and is intended to replace once HB-ZJA. HB-ZMH cancelled - EC-120B Colibri HB-ZMH of Helipool GmbH has been cancelled in the swiss aircraft register. The helicopter was sold to the German Bundespolizei and will be new registered in Germany as D-HSHG. HB-ZTO new registered - AS.350B3e (H125) s/n 8468 built in 2018 is new registered as HB-ZTO operated and owned by Europavia (Suisse) SA.